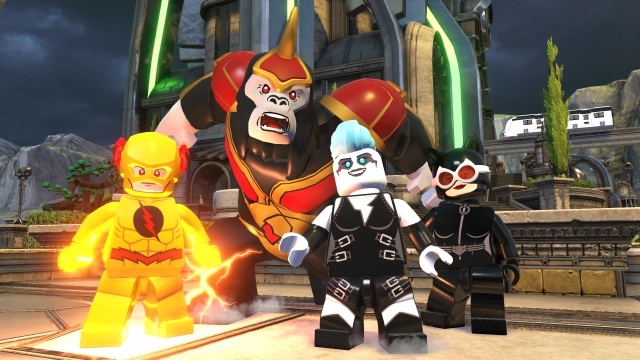 Taking its inspiration from the comic Forever Evil, LEGO DC Super-Villains puts you in the role of villains forced to be heroes to save the Earth from superheroes who are actually villains. The Justice League's top heroes disappear in a flash of light, just as variations of those heroes from the parallel universe of Earth-3 appear. The Earth-3 heroes vow to fill the void left by the Justice League and to find out what happened to the missing heroes, but their intentions are just the opposite. These parallel world heroes are actually villains and members of the evil Crime Syndicate. The Legion of Doom bands together to expose the fake heroes and find out what happened to the Justice League because, as Harley Quinn puts it, "we may be the bad guys, but they're the worse guys." 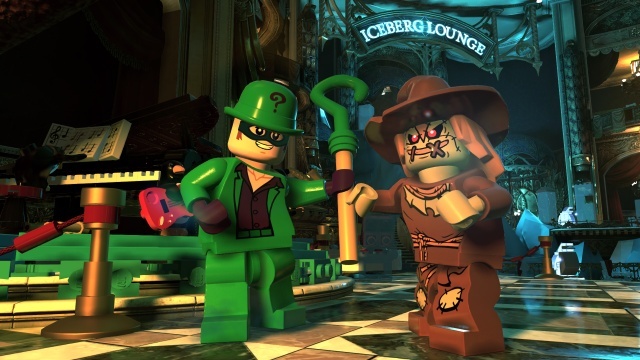 Besides giving you the chance to play as characters from the extensive villain roster of the DC universe, LEGO DC Super-Villains makes you a part of the story as well. LEGO games have had a character creator for a while, but it's always been an extra feature, tucked away from most of the gameplay. Now it's front and center, and one of the first things that you'll do in the game is create your own villain. The new character creator tool is far more extensive than those in the past, and the number of available heads, torsos, legs, accessories, and more can almost be overwhelming (don't worry, though, if you don't like the look that you came up with at the start of the game, you're free to edit it at any time later). You can also customize how your powers are manifested, for example whether a beam power comes from your eyes or hands, the color of the beam, and any special effects. Most of your powers are determined for you, and you'll earn new powers as the game progresses, but you'll be able to choose a couple of things such as whether or not you have super speed. The tool is so extensive that you can easily find that your first play session with the game will be spent mostly designing your ideal super villain. The gameplay in LEGO DC Super-Villains doesn't deviate much from the LEGO game formula, which is fine if you enjoy this series as I do. The story is told through the game's linear levels which are connected via free-roam hub areas. The first time you play through a level your cast of playable characters is set for you, but any completed level can be revisited with any of the villains that you've unlocked so far in order to use some different unique powers to unlock areas that were inaccessible to you the first time through. The game can be played co-op with a second player able to join or leave at any time, and when you play solo the AI controls the other characters. In either mode you can freely switch between the characters when you need to make use of a particular power. The levels are all highly destructible, and you're encouraged to bash every LEGO object in sight in order to unleash the LEGO pips that are used as the game's currency. It was always a little strange to spend so much time destroying things in the super hero LEGO games, but it feels quite natural when you're playing as a villain. Somewhat ironically, this is also one of the most fun aspects of a game that's based on a building set toy. You'll also have the opportunity to make things from LEGO, but these opportunities occur only at designated points and the building is completely automated as you keep a button pressed down on the controller. I liked when the series began to introduce more interactive build elements such as in LEGO The Hobbit, but at this point it doesn't look like we'll see that again. The game has some light puzzle elements that are based on applying the right power at the right place, completing a mini game, or finding ways to access hidden areas. The puzzles that need to be solved to progress through the game aren't very difficult and the game is quick to offer hints if you ever find yourself stuck. However, getting to 100% completion on a level is a bit challenging, and finding your way to every hidden area or discovering every last collectible will take some work. The level design in the game is excellent - you'll find yourself enjoying the imaginative environments and looking forward to what each new level will bring. The levels are all fairly large, featuring a number of different areas for you to make your war through before reaching the end. I didn't mind that the levels were long, in fact, I thought it was nice that they were, but the save system is a sore spot with me. It's never quite clear when the game will save your progress mid-level, and I found on several occasions that when I returned to the game I had to replay a portion of the game that I had previously played through during my last session. Annoying, but not a deal-breaker. The story is filled with that signature LEGO game humor, but LEGO DC Super-Villains really shines in this area. The super hero games managed to poke fun at some of the inherent pretentiousness in heroes, but were a little constrained in how far they could go. When everyone's a villain, anything goes, and you get the impression that everyone behind the game had a lot of fun letting their bad sides loose. Part of the magic of the game's playfully bad appeal comes from the excellent voice work in the game, with the characters voiced by a virtual who's who of character actors with legendary super hero genre resumes. The game's open world hub isn't just a place for you to move from one story level to the next - it offers plenty of gameplay on its own. There's the usual running around exploring and breaking objects for pips gameplay, but there are also a number of side quests that can help you unlock additional villains for play and collectibles to be found. There are a number of locations to visit in the open world including both iconic DC cities, Gotham City and Metropolis, as well as smaller corners of the DC universe like Smallville. One last thing deserves special mention - the game's opening thing is Wolfmother's Joker and the Thief. Best licensed track of the year goes to LEGO DC Super-Villains. If you've played LEGO games before, then you already know what to expect from LEGO DC Super-Villains. The latest game in the series delivers the gameplay and humor that the series is known for, and if you've enjoyed other games in the series, then you'll certainly enjoy this one. On the other hand, if you feel like you've been there done that with LEGO games, then you have. 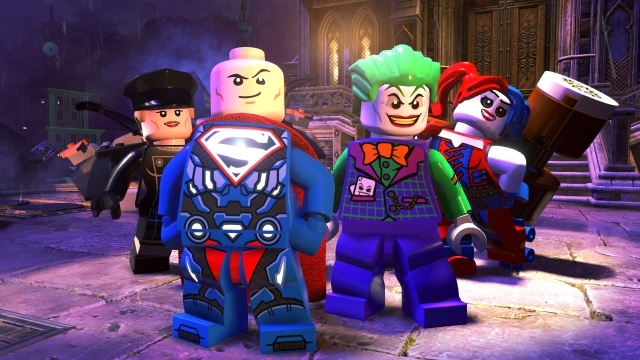 If you're new to LEGO games, then LEGO DC Super-Villains is a good place to jump in. The quirky and humorous storyline, imaginative level design, and unusual villains as heroes spin on the super hero genre make it one of the better recent LEGO games. Final Rating: 85% - Bring out your inner villain in the name of good.